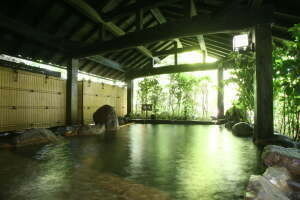 Just go down the stairs from the lobby area and you will find the men`s (男性) and women`s　(女性) changing rooms,indoor baths and spacious outdoor baths which are open from 6:30am to 23:00 for guests` use. 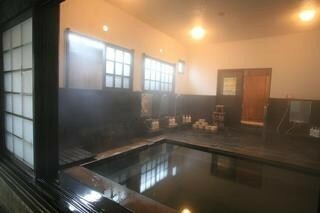 There is no mixed bathing in the main baths at Wakaba. If you would like to bathe privately you may reserve one of the private indoor `family baths` for an hour anytime between 13:00 and 10:00 the following morning (just ask at reception if you would like to make a reservation). Late at night, after 23:00, no reservation is necessary. 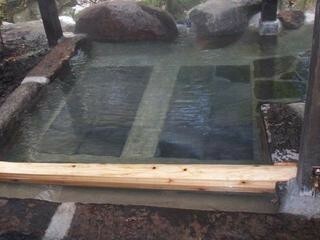 The spring water here is mildly acidic (PH3~6), suitable for all skin types and said to relieve fatigue and insomnia. 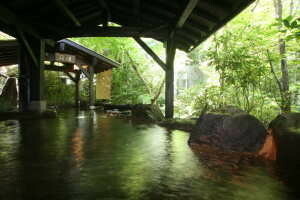 The secluded outdoor baths are surrounded by bamboo and greenery set very close to the river. 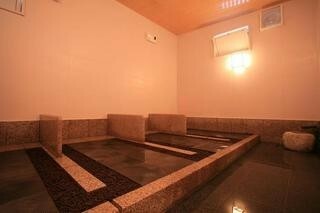 At the far end of both the men’s and women’s outdoor baths there is a shallow area in which you may bathe lying down. Why not try a relaxing bath at night and then another wake-up dip in the morning? Shampoo,conditioner and soap are provided. l Mind your step in the bathing areas and please enter the baths carefully as there is a stone ledge before you step down into the actual bath. We highly recommend that you try our stone sauna as an alternative to the traditional sauna. 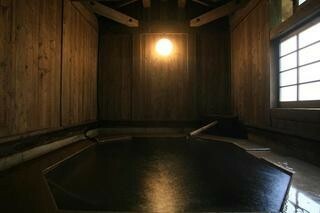 A private sauna with 3 places,or one with 4 places can be rented for a 60-minute session for \1000 anytime between 13:00 and 22:30. 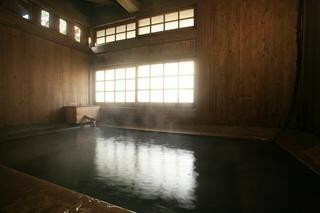 You will be provided with loose cotton pyjamas to wear in the sauna while you relax and lie down on the heated rocks. In a 60-minute session we suggest that you first lie facedown (spreading a bath towel on the stones and using a small towel as a pillow) for 5mins,then on your back for 10mins,then cool down outside, take a drink and rest for 5 mins. Repeat this sequence two more times,then take a bath when you have finished. The stone sauna is a unique and relaxing experience in any season. *Please leave your room key at reception when you use either the stone sauna or baths. Why not pamper yourself and book a massage in our Salon? 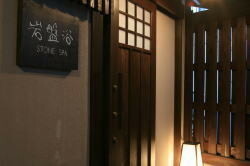 Currently a half-body Balinese massage using oils is offered for¥8000 and a full-body massage for ¥11,000. 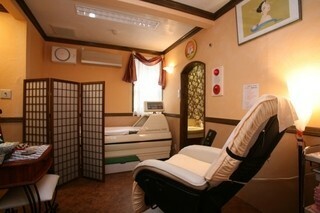 A foot massage is ¥4000 and a relaxing head massage only ¥3000. Open from midday to 11pm,but times may vary and reservations (last slot from 9pm) are necessary so please ask at reception for details. Payment is made on checking out.